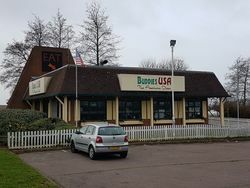 An American diner beside the eastbound A45, very close to Rushden Lakes. The former Little Chef and Kelly's Kitchen. 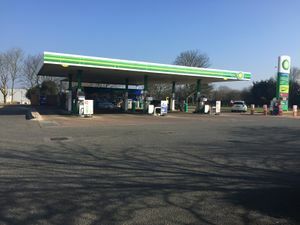 In 1984, Hamblin Group proposed three possible sites for an eastbound service station between here and the next roundabout, all called Sanders Lodge. This had a workshop to the west, a café in the middle and a motel behind it. In 1985, Norfolk House applied for another site here, with a slightly different building to what's there now. The motel was added in 1988. The restaurant was opened by Kelly's Kitchen, which became Little Chef. This closed in 2005 and is now the diner. The forecourt was a Petrofina (later Total).